EJ Phillips made her professional stage debut in Boucicault's play London Assurance in 1852 in Hamilton Canada. John Nickinson's greatest role was Havresack in Boucicault's Napoleon's Old Guard The Samuel French script https://babel.hathitrust.org/cgi/pt?id=mdp.39015063763273 lists John Nickinson as appearing in this in 1848 at Mitchell's Olympic Theatre. It was first produced in London in 1844 and in New York in at the Chatham Theatre in 1845 with J. Booth and Mrs. Booth as Melanie, at the Park Theatre in 1847 with Henry Placide and "Mr Nickinson and his talented daughter have still more recently enacte the parts of the veteran and his child at the Olympic, with decided success." Melanie is obviously a reference to the character played in Napoleon's Old Guard by both Charlotte Nickinson and EJ Phillips. Maud Harrison made her stage debut in 1875 in Boucicault's The Flying Scud or Four-Legged Fortune, the first of the popular horse racing melodramas. The only direct knowledge I have of EJ Phillips in The Octoroon is a color copy of a playbill which hangs in my living room. Boucicault was 63 in 1883. His first wife died in the Alps shortly after their marriage. Agnes Robertson, his second wife is not mentioned in these letters. His third wife Louise Thorndyke Boucicault is briefly mentioned. Cleveland Nov. 17, 1893 Miss Elsie deWolfe did not gain her bit of diplomacy as Miss Ada Dyas & Mrs. Thorndyke Boucicault are engaged for A Woman of No Importance. Biographer Richard Fawkes tells how Boucicault left New York for San Francisco in April 1885 with his son Dot, daughter Nina and Louise Thorndyke, who was then 21. They traveled to New Zealand and Australia. Boucicault was 64. He and Louise were married in Sept. in Sydney and Boucicault claimed to be a widower on the marriage certificate, though his wife Agnes Robertson was alive in London. Boucicault had been claiming they were never legally married. Son and daughter promptly cabled their mother who took out an ad claiming he was a bigamist. The newlyweds were in no rush to return to America and when they did they appeared in his play The Jilt, which drew in crowds eager to see the couple. Dion Boucicault spent most of his last years teaching at a drama school established by AM Palmer. "The gentlemen were for the most part, awkward, stiff and slow, the girls graceful, quick and refined. Among the lady students we found twenty-two who aspired to be Juliets and Paulines and Parthenias, and one who consented to play old women. When faced with this result Mr. Palmer could not refrain from quoting Falstaff's bill of fare "Two gallons of sack for one half penny worth of bread!" D. Boucicault "My Pupils" North American Review 148 November 1888:435-440. It was a crowded night at Wallack's theatre. 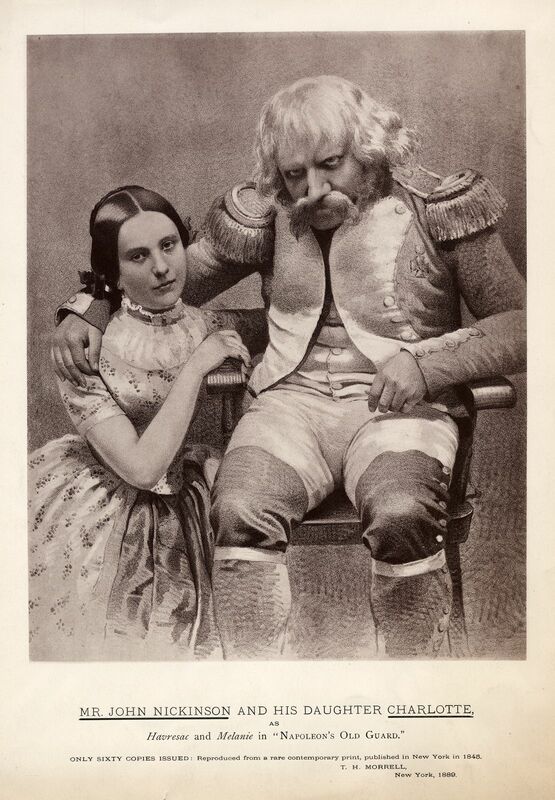 The play was "The Shaughraun," with Dion Boucicault in the title role and Harry Montague and Ada Dyas as the lovers. The popularity of the admirable English company was at its height, and the Shaughraun always packed the house. In the galleries the enthusiasm was unreserved; in the stalls and boxes, people smiled a little at the hackneyed sentiments and clap- trap situations, and enjoyed the play as much as the galleries did. The only play by Dion Boucicault I've been able to see has been The Shaughraun in Boston in 1996 -- which with lots of drinking, fiddle playing, singing and dancing gave me the insight that this was the 19th century equivalent of sit coms. Im still looking into the relationship betwen AM Palmer and Boucicault, which seems to have been contentious at times. Quinn, Arthur Hobson, Representative American Plays, Appleton Century Crofts, 1953 includes Boucicault's Octoroon, as well as Fashion, Hazel Kirke, Margaret Fleming and other contemporary plays. Thanks to Bonnie Walters for this volume. Captain Swift was slightly altered and staged by Boucicault for Palmer during the 1888-1889 season.